Why doesn’t James White rebuke Michael Brown (aka Zero Spirit Man) defending the ‘Sneaky Squid Spirit’? Home › Uncategorized › Why doesn’t James White rebuke Michael Brown (aka Zero Spirit Man) defending the ‘Sneaky Squid Spirit’? “It just strikes me that charismatics should be the people with the most balanced & best understanding of the doctrine of the Trinity. If they are so full of the Spirit then they should know all about the Spirit’s relationship with the Father & the Son. They should know the bible inside & out on the subject. They should have discernment like you would not believe, and have such a balance in their view of the Spirit. Just the exact opposite is what you see in charismatic churches. You do not see the New Testament balance. You do not see the Spirit testifying of the things of Jesus & not of Himself. You get this imbalance & you don’t get an understanding. You end up with a lot of modalism, you end up with a lot of heresies and certainly it is perfectly correct, as was said more than once at the Strange Fire Conference, that the charismatic movement has been the doorway through which so much heresy & falsehood entered into the church in our day. How this is not a rebuke against Dr Michael Brown? Denies being considered an Apostle of the New Apostolic Reformation (NAR). Downplaying, and/or denying, the existence of the NAR. Mischaracterizing and blocking his critics, particularly on social media. Denies his involvement with the New Apostolic Reformation. Claims he is a Pentecostal (when in fact Pentecostalism condemns his practices and beliefs). He continues to endorse convicted criminal NARpostle David Yonggi Cho, defended NARpostle Brian Houston who lied to a Royal Commission and covered up his father’s crimes of pedophilia (both which are serious offenses), and defended NARpostle Benny Hinn, who financially exploits people. 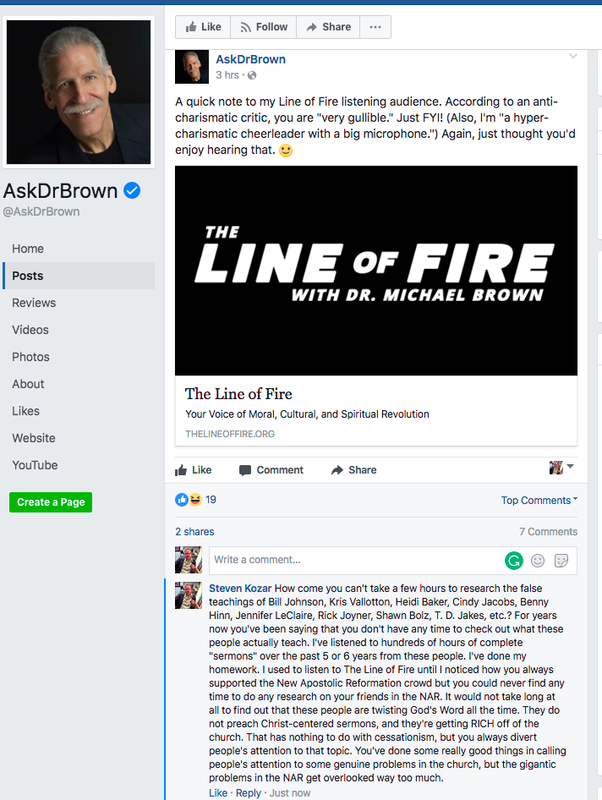 Recently Chris Rosebrough called into Michael Brown’s ‘Line of Fire’ program in order to challenge him about Jennifer LeClair’s ‘Sneaky Squid Spirit’ doctrines. When you listen to the exchange, Dr Brown comes out defending this false (NAR) prophet Jennifer LeClaire and her teachings on the ‘Sneaky Squid Spirit’. This was a very revealing conversation, given that he also appears to demean Pastor Chris Rosebrough for holding to Sola Scripture as the means of prophecy of “traditional” Christian practices. This is the nature of the NAR, to continually show public disdain to the historic Christian faith “once and for all delivered to the saint” (Jude 1) and repeatedly elevate personal revelation and teachings at the expense of Jesus Christ and His Word. And this is exactly what Michael Brown (guilty of ZERO discernment and ZERO spirit), did. He once again exhibited his NAR ‘snobbery’ so as to avoid scrutiny – tap dancing around the issues raised by Pastor Chris Rosebrough. Brown gave the impression that (non-charismatic) Christian pastors are in the wrong for holding to sound Christian doctrine, while at the same time giving a pass to LeClair’es ‘Sneaky Squid Spirit’ doctrine. Yet Dr James White STILL endorses this “Zero Spirit” man. A quick note to my Line of Fire listening audience. According to an anti-charismatic critic, you are “very gullible.” Just FYI! (Also, I’m “a hyper-charismatic cheerleader with a big microphone.”) Again, just thought you’d enjoy hearing that. One such person, whose initial comment was deleted, is Steven Kozar of Messed up Church (who states he used to be an avid listener of Dr Michael Brown). ‹ Benny Hinn’s claims to being an Apostle.